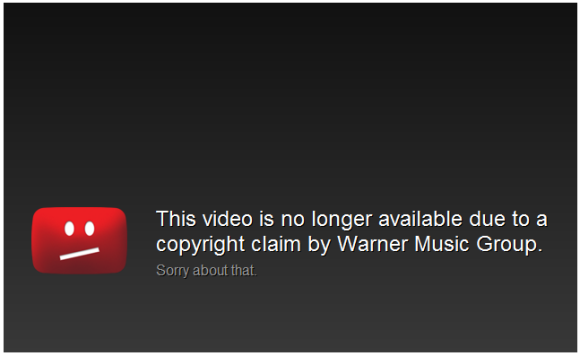 For some reason, reading a message like "This video is no longer available due to a copyright claim by Warner Music Group. Sorry about that." 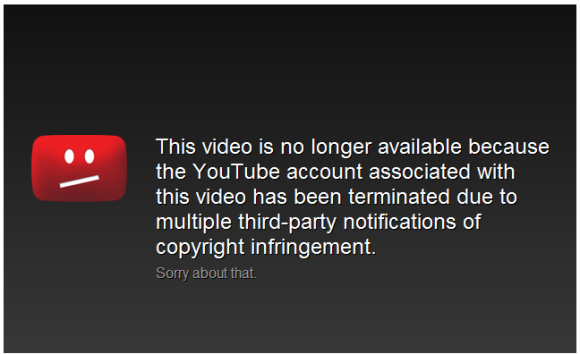 when trying to watch a YouTube video is no longer disconcerting. 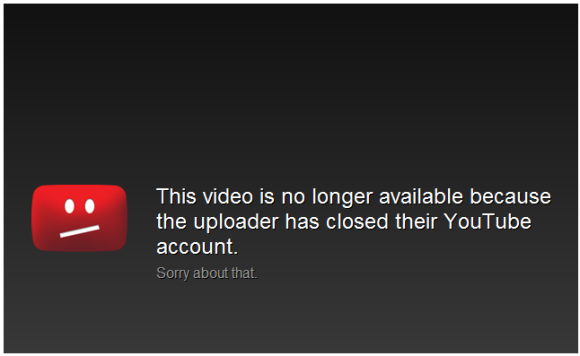 YouTube's new error pages are so endearing and quirky that you'll forget you can't watch certain videos. They remind me of Chrome's sad tab and Apple's sad Mac or sad iPod icon. 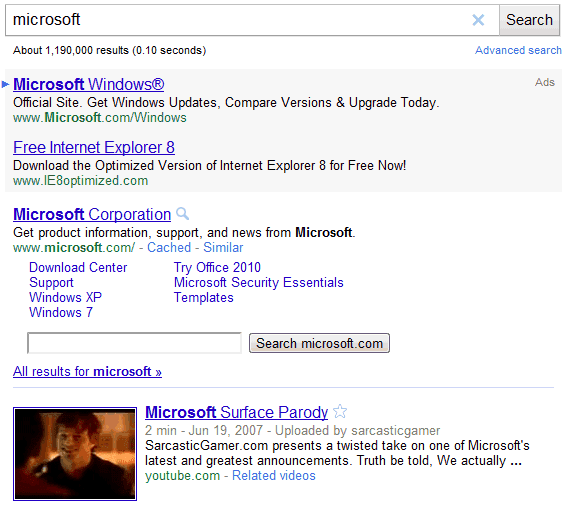 Google started to show the most relevant web page at the top of the video search results. The strange OneBox result is only displayed for navigational queries, which usually return a single significant result. To try this feature, go to Google's homepage, enter a random query, then click "Videos" in the sidebar and enter a navigational query (for example: microsoft). Sometimes the ads and the top result take so much space that they push video results below the fold. Google tests a new ad block below messages. It's not available to everyone, so Google probably tests its effectiveness. Jordon, a Gmail user who spotted the new ad format, thinks it's "a bit more direct than other GMail ads", while Daniel Spiewak finds it annoying. It's certainly more noticeable than the ads from the right sidebar and you might accidentally click it when you try to reply to a message. 1. Google Chrome's bookmark sync will be extended to sync the documents stored in Google Docs. 2. Google will launch a service that indexes and ranks web applications. 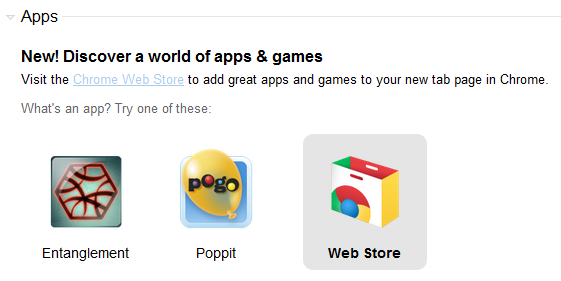 It's not exactly what I predicted, but Chrome Web Store could become a search engine for web apps. 3. Google will use different interfaces for displaying search results, depending on your query. If you use a query that returns a lot of useful local search results, Google mixes local search results with regular web search results, while showing a small map in the right sidebar. 4. Google's search engine will group related results. 5. Google Image Search will let you upload an image and will show related images from the web. You still need to use Google Goggles or TinEye. 6. Google Street View's images will become searchable and Google will start to show information about different places in Street View. 7. Google will release an online development environment optimized for building web applications. 8. An open platform for search experiments: tweak Google's ranking factors, customize the interface and create a better search engine. 9. Android will have more users than Windows Mobile. According to Comscore, Android surpassed Windows Mobile in the US in July. Gartner estimates that more than 20 million Android phones were sold in the third quarter of 2010. That's 40% of the Windows Mobile devices sold until 2008. Safari and Opera added support for lightweight extensions, Firefox 4 dropped the status bar, almost all browsers dropped the classic menu bar, Internet Explorer 9 is surprisingly fast and standards-compliant. 11. 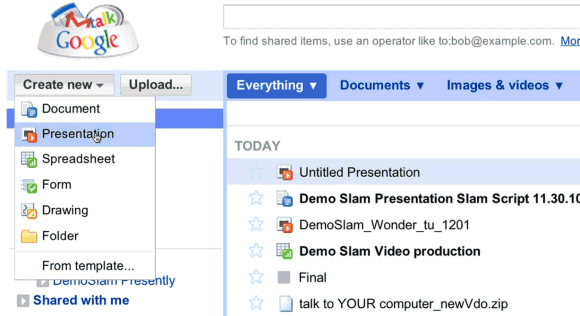 Google Drive will finally launch, but it will only be an extended version of Google Docs. 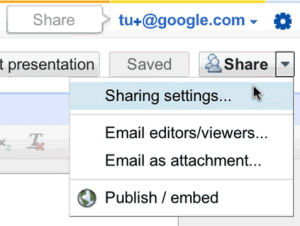 Instead of sending attachments, you'll be able to upload files to Google Drive from Gmail. You can now upload any kind of file to Google Docs. 12. Google Wave won't become successful, but its features will be used in other Google products. Google Wave has been discontinued, but many of its features are used in other services: the new Google Docs editor, Shared Spaces, contextual spell checking in Google Search. 13. Google will buy True Knowledge and will launch a fact search engine. Google bought Metaweb, the company that developed Freebase, an "open, shared database of the world's knowledge". 14. Gmail's spam filtering algorithms will be more transparent and you'll be able to define custom rules for flagging messages as spam. Google found an interesting way to make filtering messages more flexible: Gmail Priority Inbox. You can define custom rules for messages that aren't important and Google explains why certain messages are classified as important or not important. 15. Google Trends will show popular web sites from different categories. 16. Google Desktop will be discontinued and replaced by Google Quick Search Box. 17. If you use Google Chrome, you'll be able to use the most important features of Chrome OS. Most of the Chrome OS features are available in Google Chrome: Cloud Print, integration with Chrome Web Store, synchronization, guest mode. 18. Google users will be able to add comments and start conversations if they want to find some information about a hot topic. Google acquired Aardvark, a social service for answering questions. 19. Google Toolbar will be available for Chrome and Google will start to bundle Chrome with Google Toolbar for IE. 20. Google will buy Spotify and make it available for free. Google bought Simplify Media and intends to release a music store and an Android application for streaming music. 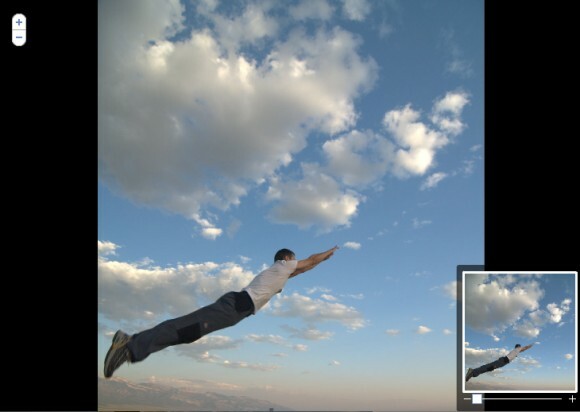 Picasa Web Albums has a new zoom viewer that uses Flash. If you click on the magnifying glass icon next to a photo, you can select a rectangular region from the image and zoom in or zoom out. The feature is called "microscope zoom" and it doesn't fall back to the old version for users who haven't installed Adobe's Flash plugin. 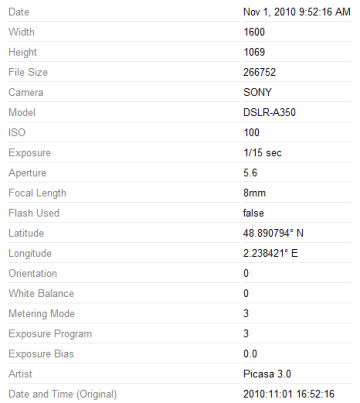 Another new feature lets you view all the EXIF tags that are available by clicking on "full details page". You'll find a lot of tags that offer more information about white balance, orientation, exposure, color space, brightness, light source and more. 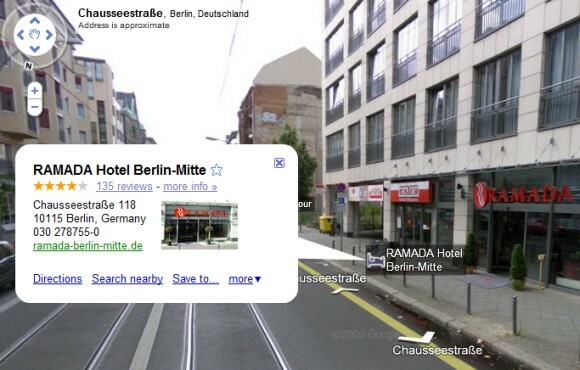 There's a new iGoogle interface that's only available to a small number of users. Google dropped the rounded corners and only shows the controls when you mouse over a gadget. Another change is that gadgets have a small icon next to the title. 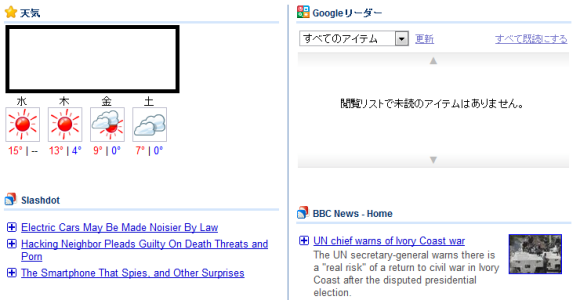 Avery M., who sent this tip, noticed the new interface when visiting iGoogle Japan, but that could be a coincidence. 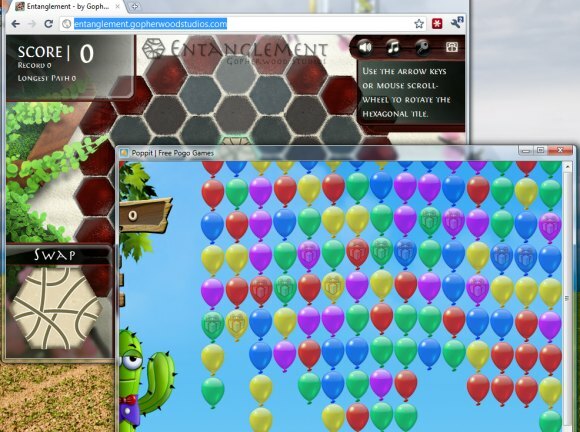 The first Chrome 10 Dev Channel build bundles two HTML5 games: Poppit and Entanglement. The two games are added to the new tab page even if you've previously installed other apps. Some users will probably be surprised to see two games they didn't install, so Google should inform users that the games were automatically installed. Chrome's source code makes it clear that Poppit and Entanglement are installed for all operating systems, except for Chrome OS. Probably a better idea would be to recommend some apps based on the browsing history. What happens with all the Google Wave gadgets, now that Google Wave has been discontinued? They're available in Google Shared Spaces, a small Google Labs project that helps you collaborate with other people by adding information to a gadget. You can add placemarks to a map, draw on the same white board, play Sudoku, create lists, find the best budget accommodation, brainstorm, create diagrams and answer to polls. Maybe Google Wave would've been more successful if it didn't have so many complicated features and ambitious goals. Google Wave could've been the back-end technology for many cool web apps, instead of trying to incorporate all the use cases in a single interface. "Chrome OS could potentially mark a profound leap forward. For the first time, all the layers between the network and the computer have been removed. The device itself is of little consequence; you can 'feel right at home' from any networked device. Chrome OS isn't so much about what has been added, but what has been stripped out; no more complicated file systems, software updates, etc." Paul Buchheit, the ex-Googler who created Gmail, thinks that the ideal design of a computer that acts like a local node of a global super-computer matches the design target of Chrome OS. "It should be relatively cheap and reliable, secure (no viruses or anything), zero-administration (I don't want to be a sys-admin), easy to use, and fast." Paul says that Chrome OS is unnecessary because iOS and Android devices meet the same ideal and there are already millions of devices that run these operating systems. There are already millions of people who use Chrome and some of them would like to buy a computer that's as fast as their browser. Mobile phones are not yet powerful enough to handle complex web apps, but that will change and, at some point, web apps will be indistinguishable from native apps. You'll be able to use your favorite web apps from almost any device, but why not use a device that removes everything that's unnecessary and slows you down? Google tries to make Picasa Web Albums a little more social, but it's not easy to convince users that this is a good idea. I posted in August that Google will link Picasa Web Albums with Google Profiles. On the surface, this is a minor feature, but Google didn't manage to explain users why it's important. "Together at last! 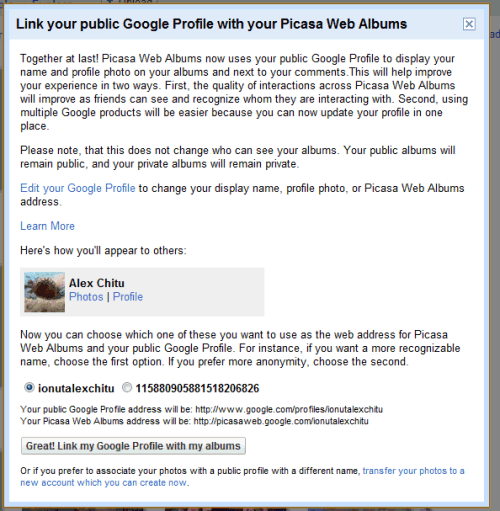 Picasa Web Albums now uses your public Google Profile to display your name and profile photo on your albums and next to your comments. This will help improve your experience in two ways. First, the quality of interactions across Picasa Web Albums will improve as friends can see and recognize whom they are interacting with. Second, using multiple Google products will be easier because you can now update your profile in one place." It makes sense for Google to have unified public profiles that integrate will all services, but users may find this disconcerting. Why take away my hard-earned alternate username and change it with a number? Why not use a different number in the URL than the Google Profiles ID, like Google Reader does? Why associate my photos with a public profile that includes my name and my Google Buzz messages? Custom usernames were useful and I don't see why Google isn't more flexible. You should be able to keep the existing username or at least pick an URL that can't be guessed from your profile address. Instead of trying to make profiles more flexible, Google decided to disable most of the features until you link your Google Profile. You can no longer share a photo, favorite a user, add a comment. If you still don't like the new feature, you have the one-time opportunity to transfer your photos to a new account. You can't force users to use a new feature by crippling the other features and then expect them to like the new feature. the chief reason for this profiles change is because we want the vast majority of pwa users to have a quality experience with other pwa users. right now, its common for a pwa user to get a comment on a photo from another user, and have the comment be effectively meaningless because it was posted by 'DJJazzyJeff01234'. we've heard from many users how this freaks them out, and makes pwa a scarier place. we think this makes for a low quality social interaction between users and does not cause further engagement. the other main reason we're doing this is to simply help users manage their google profiles better across multiple google products. the reality is that many of our users use several google products, not just picasa. the new model lets you manage your profile ONCE, and you're done. in the end, you still will have total control over what others see. you can set your profile to show your full name publicly OR simply opt-out of your name being found in search. also your profile won't display any private information unless you've explicitly added it. This year, Blogger's team added so many new features that it's difficult to count them: dynamic templates, comment spam filtering, a new way to manage comments, real-time stats, better post preview, static pages and so much more. Blogger is one the few Google products that have improved dramatically this year, after many years when it was neglected. Since a lot of people use phones to browse the Web, it makes a lot of sense to add a mobile interface for Blogger and to create mobile versions for Blogger's templates. There's no mobile Blogger yet, but all Blogger blogs have a mobile version optimized for WebKit browsers. Just add ?m=1 to the URL of any Blogger blog, and you'll get a simplified version that works well on an iPhone, Android phone and probably other phones that use a browser based on WebKit. Here's an example: http://googlesystem.blogspot.com/?m=1. Bloggers can enable the mobile version of their blogs, so that visitors are automatically redirected to this version when they're using a supported mobile browser. This option is only available if you go to Blogger in Draft, click on "Settings", switch to "Email & Mobile" and enable "Yes, On mobile devices, show the mobile version of my template." This didn't work for me, so you'll still see the regular mobile version of this blog that uses a custom stylesheet. Google says that the new feature only supports 12 existing templates (6 variants of the Simple template and 6 variants of the Awesome template) and that all the other templates will be rendered as the Simple template. The mobile version drops the sidebars and most of the gadgets, shows small excerpts from the posts on the homepage, hides the comment form (but you can still post comments), resizes images and videos, adjusts fonts and converts AdSense ads into mobile ads. Unfortunately, you can't customize mobile templates, at least not yet. 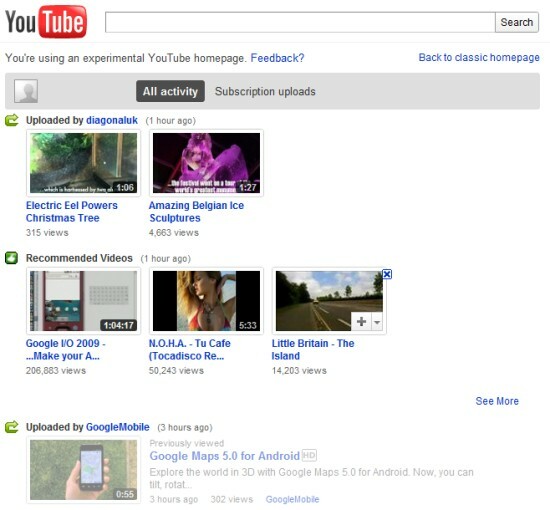 YouTube's embedded player has a new feature that lets you add a video to a special playlist and watch it later. 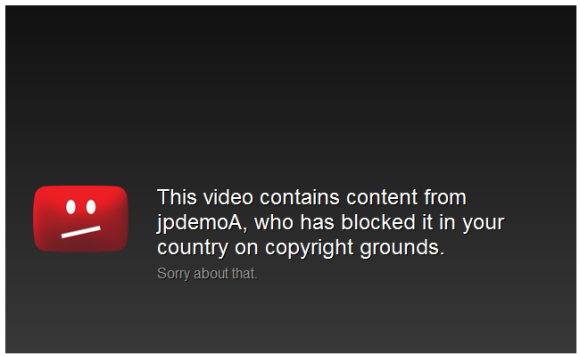 This only works for the videos embedded using the new iframe-based code. After clicking on "watch later", the video is added to your homepage, so you can quickly find it. It's not very useful for Read it Later or Instapaper fans, but everyone else will probably enjoy the new feature. What's surprising is that YouTube doesn't add the videos to the queue, which is "a list of videos to watch later in your session". Last month, a Reddit user found an unexpected way to use Google Translate: as a beatbox. You could also use this permalink, but it's less exciting. There are many other variations you could try. Google decided to make it more obvious that this is an Easter egg by replacing "Listen" with "Beatbox". No translation is perfect, and that's especially true for a machine translation service like Google Translate. From now on, when you translate a text using Google Translate and Google finds some reliable alternate translations, you can pick one of them. "Just click the translated phrase and you'll see a pop-up menu of possible alternates for that phrase, as well as the original phrase highlighted in your original text. Not only can these alternative translations give you a better understanding of a confusing translation, but they also allow you to help Google choose the best alternative when we make a mistake," explains Google. It's interesting to notice that the new feature helps you better understand the technology behind Google Translate. "Typically, when we produce a translation, our system searches through millions of possible translations, selecting the best -- that is, the most statistically likely -- translation. With this feature, we expose more of those possible alternatives." Right now, Google only shows alternate translations when you try to translate a text, so this doesn't work for web pages. Rickrolling seems to be Google's favorite prank. 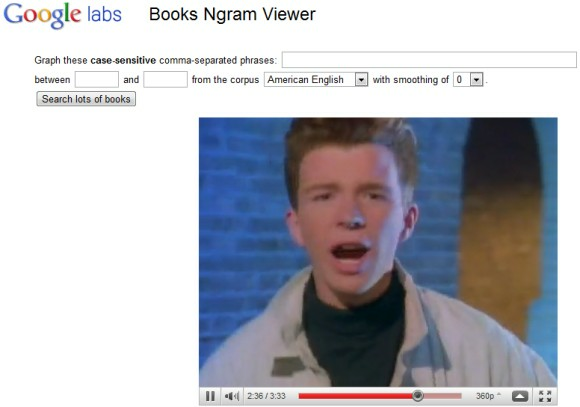 If you try to search for [never gonna give you up] in Google's recently launched Ngram viewer, you'll have a pleasant surprise: a YouTube video of Rick Astley's "Never Gonna Give You Up". One of the most annoying things about Google's contact manager is that it doesn't have a "trash" section. If you accidentally delete some of your contacts, it's impossible to retrieve them without a backup. This is a big problem if you use a buggy software that tries to sync your contacts, but manages to overwrite them. Google tried to address this issue by adding a new option that lets you restore your contacts. You'll find it if you visit Google's contact manager and click on the "More actions" button. "You can restore your contact list to the state it was in at any point within the past 30 days. 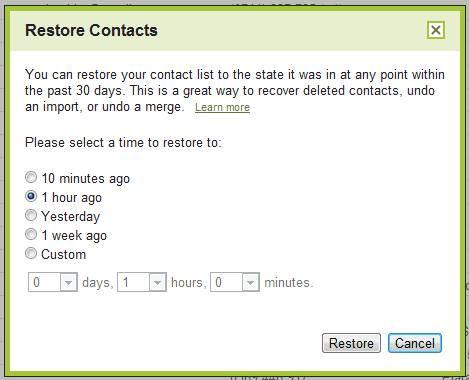 This is a great way to recover deleted contacts, undo an import, or undo a merge," explains Google. While this is a very useful feature, Google's implementation doesn't help users who don't remember when they made a mistake. Google should have listed the most recent changes and allowed users to pick one of the revisions, like in Google Docs. 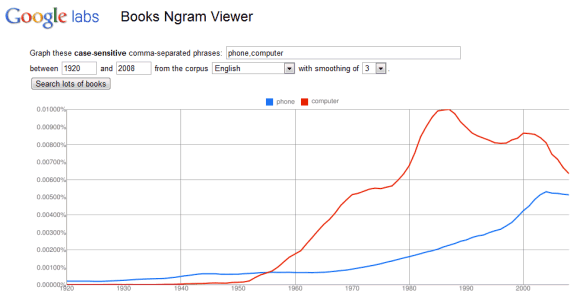 Google used some of the data obtained from 15 million scanned books to build Google Books Ngram Viewer. "The datasets we're making available today to further humanities research are based on a subset of that corpus, weighing in at 500 billion words from 5.2 million books in Chinese, English, French, German, Russian, and Spanish. The datasets contain phrases of up to five words with counts of how often they occurred in each year. (...) The Ngram Viewer lets you graph and compare phrases from these datasets over time, showing how their usage has waxed and waned over the years," says Jon Orwant, from the Google Books team. The nice thing is that the raw data is licensed as Creative Commons Attribution and can be downloaded for free. Maybe Google should use the same license for the Ngram database obtained from indexing the web. 1. Make sure that you use Google Chrome 9 (beta, dev), Google Chrome 10 (Canary) or a recent Chromium build. For example, you could type about: in the address bar. 2. Type about:flags in the address bar. 3. Click "Enable" next to Tabbed Settings and then click the "Restart" button at the bottom of the page. This will restart the browser. 4. Click the wrench menu and select Options. 5. Select Under the hood and pick a value from the "Page zoom" drop-down. If you don't like Chrome's tabbed settings interface, you can go back to the standard settings dialog by disabling Tabbed Settings from about:flags. You won't lose the default zoom level, but you'll have to switch to the tabbed interface if you want to change it. Bonus tip: Another option you can change from the tabbed settings interface is minimum font size (Under the hood > Web Content > Customize fonts > Minimum font size). YouTube wants to create a more comprehensive newsfeed that includes your actions and all the actions shared by your subscriptions and friends. Unfortunately, the homepage is no longer customizable. 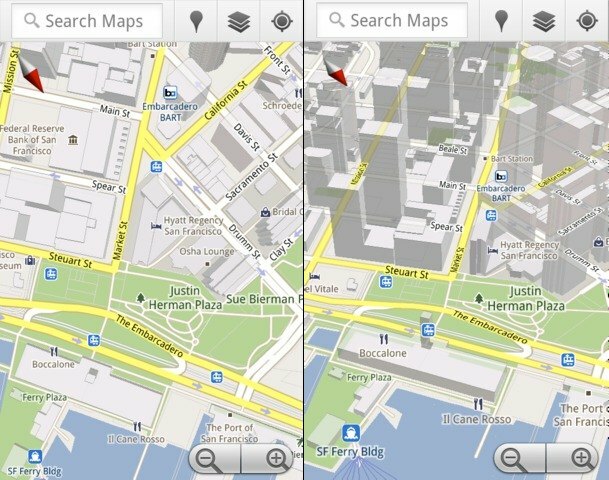 Google Maps 5 for Android comes with two features that make Google's mapping software a lot more useful. Google now uses vector graphics instead of map tiles and it caches some of your most frequently used maps so that they are available offline. The new 3D view makes maps more intuitive and easier to use, but that's not all. Since Google no longer has to download map images from its servers and vector-based maps require 100 times less data for all zoom levels, it's feasible to cache data. "Rather than having a static set of maps when installed, Maps will automatically start caching the areas you visit the most when your device is plugged in and connected to WiFi (e.g., the nightly charge)." You can't manually control caching, but it's an important first step toward an offline Google Maps. Google also promises to add offline rerouting to Google Maps Navigation. "You'll still need a connection to start a route, but if you miss a turn along the way, we'll quickly get you back on track, even if you don't have an Internet connection." Google Maps 5 for Android uses about 70% less data than the previous version, so it loads maps much faster. The new features require Android 2.0+, but not all devices support them. The list of devices that support all multi-touch gestures includes: Samsung Nexus S, Samsung Galaxy S, HTC G2, HTC Incredible, HTC Evo 4G and Motorola Droid/Droid 2/Droid X, while HTC Nexus One, HTC Desire, Sony Ericsson X10 and LG Ally don't support rotating gestures. Google Chrome 9 beta is now available and, unlike the previous two versions, it comes with a lot of new features. The built-in Adobe Flash plugin is now sandboxed, just like Chrome extensions and tabs. "The sandbox adds an additional layer of protection to further guard against malicious pages that try to hijack your computer or steal private information from your hard drive. Based on this groundwork in the beta, we'll be bringing the sandboxed Flash Player to Chrome for Mac and Linux in future releases as well," explains Google. Right now, the sandboxed Flash plugin is only available if you use Windows. Google Chrome 9 enables WebGL support by default. 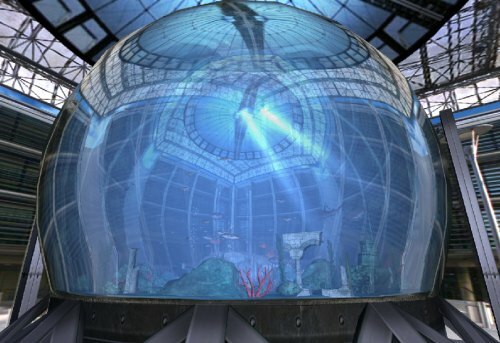 "WebGL is a new web technology that brings hardware-accelerated 3D graphics to the browser without installing additional software" and it can be used to create cool applications like Google Body Browser, Field, Aquarium and more. Chrome doesn't have many opt-in features. The latest feature that's not enabled by default is Instant Search, an extension of Google Instant that previews search results as you type and lets navigate to your favorite pages with only a few keystrokes. It might be useful to go to Gmail by just typing "m" in the address bar, but this feature could also be annoying if you actually wanted to visit miniclip.com. "The Instant feature can help you search and browse faster on the web by showing search results and webpages in the browser window as you type in the address bar, even before you press Enter. If you don't see the results you want, just keep typing and the results dynamically update," informs Google. To enable Chrome Instant, go to Options > Basic and check "Enable Instant for faster searching and browsing". Chrome Instant is not just annoying, it's also buggy. For example, Chrome's suggestions sometimes cover Google's first results. Another new feature is the integration with Google Cloud Print, but there are no web apps or mobile applications that support this technology. If you want to hide the button added by a Chrome extension, you can do it by right-clicking on the button and selecting "Hide button". When you change your mind, go to Tools > Extensions and click on "Show button" next to the corresponding extension. 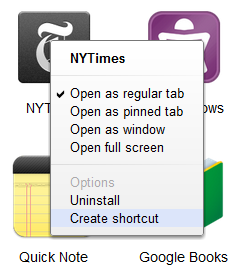 You can now create desktop shortcuts to your favorite web apps from the new tab page and open web apps in a new window. To install Chrome 9 beta, visit this page. If you use Chrome 8 beta, open the About dialog to manually update. 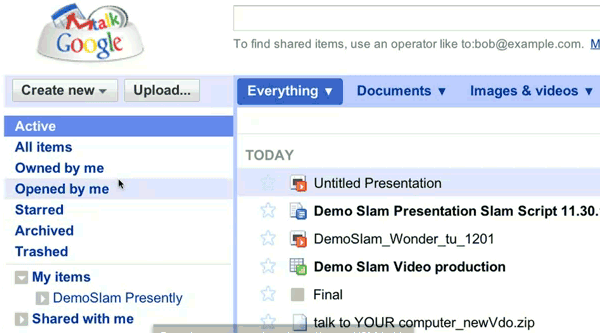 A recent Demo Slam video shows a new Google Docs interface that has separate sections for documents, images & videos and other files, new menu items for active and archived documents, a new navigation bar. Most likely, the new interface is tested internally at Google. * WebGL is available, but not enabled by default in Chrome 8 (the latest stable version). Type about:flags in the address bar, click "Enable" next to "WebGL" and then click on "Restart now". Please note that this is an experimental feature in Chrome 8. * WebGL is enabled by default in Chrome 9 Beta, Chrome 9 Dev Channel, Chrome Canary Build and Firefox 4 beta. Damon Hernandez was surprised to notice that the application doesn't require a plugin. 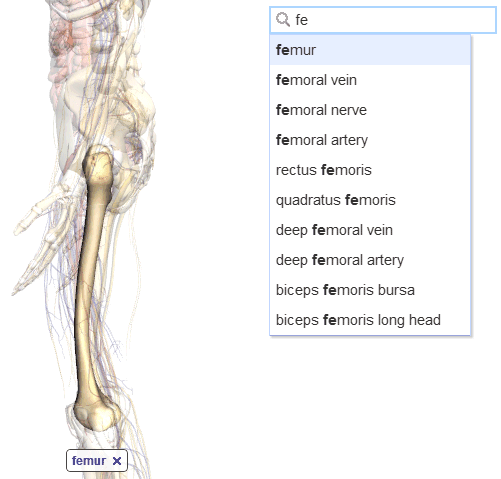 "Unlike other web based medical applications I have seen, no Flash, Java, or other plugins are needed. This application will run on any WebGL supported browser. (...) Last year I got the opportunity to work on an open standards based web3D medical app for learning the bones of the body. 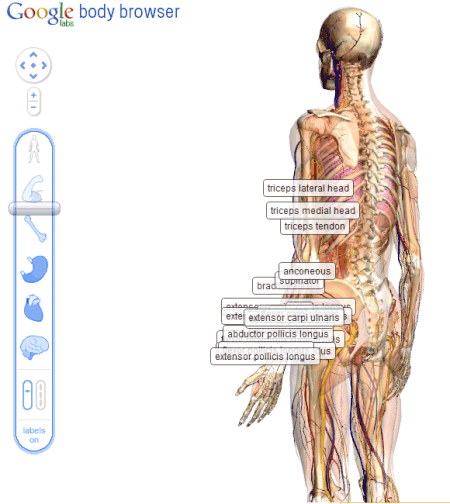 After witnessing how that app really helped students learn the bones, I am sold on using web3D for medical education." Google Apps Premier Edition has a feature that allows you to delegate access to your Gmail account to another person. It's specifically useful for business users who have assistants that manage their messages, but this feature could also be used by people who have multiple Gmail accounts. Gmail's blog announced that email delegation is now available for all Gmail accounts. Just go to Settings > Accounts and Import and click on "Add account" in the "Grant access to your account" section. Enter the email address of the person you'd like to access your account and wait until he receives a verification email and confirms the request. If both accounts are yours it's even easier because you don't have to wait. * email delegation requires the HTTPS version of Gmail. "Signing out of any one of the accounts will sign you out of all the accounts you're currently viewing, and, of course, you can revoke access at any time," explains Google. Linking to a specific timestamp of a YouTube video is not a new feature: you only need to append #t=1m30s or #t=90s to a YouTube URL to skip the first 89 seconds of the video (here's an example). Now you no longer have to manually add the special parameter to the URL. 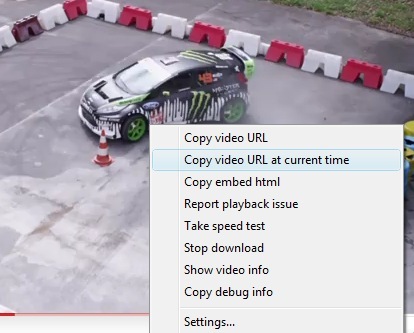 Just right-click on the video and select "Copy video URL at current time". 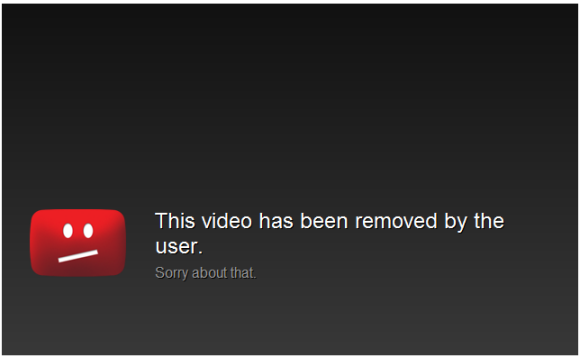 It's probably a good idea to pause the video before using this feature. The native app is better because it shows more information about the locations of your friends and it sends you to the map view when you click on a friend, but the web app is just a layer in Google Maps and this makes a lot of sense. 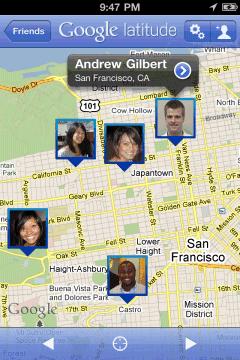 Google Latitude should not be a standalone app, it should integrate with Google Maps and Google Contacts, so you can quickly find your friends. Marissa Mayer, Google's VP of geographic and local services, has recently said that Google Latitude will add explicit check-ins, inspired by Foursquare. "Latitude is useful for a smaller group of people. Only a handful of people you'll want to know where you are at all times. There will be new layers coming on top of it. It's more useful when more people are on it. And implicit and explicit — yes, the check-in. Maybe that's in Latitude or maybe it's in Maps." When I started this blog, Google Operating System was just a metaphor for a future when Google's apps will make your operating system irrelevant. We're not yet there, but we're close and Chrome OS is an attempt to show what's possible right now. 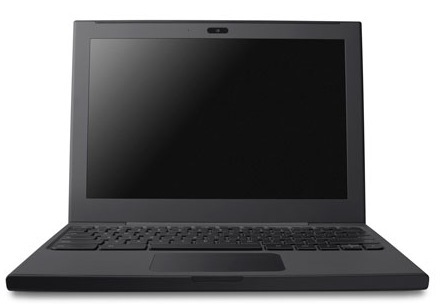 If you'd like to try an early version of Chrome OS on a notebook that's optimized for Chrome OS, post a short essay on the future of computing in a comment and you can win a Cr-48 Chrome notebook. 1. This competition is only open to USA residents. Google can't ship the notebook outside USA due to product certification requirements. 2. You must be 18 years of age or older. 3. Your essay must be original and it must be written in English. 4. You should a include a way to contact you: a link to your Google profile, a link to your website, a link to your Twitter account etc. 5. If you win the notebook, you're expected to use it regularly and send your feedback to Google. 6. The competition ends 1:59pm Pacific Time on December 14. 7. Only one of you will win the notebook. Update (December 14): Thank you for all your great comments. I'll announce the winner tomorrow. Update 2: We have a winner. 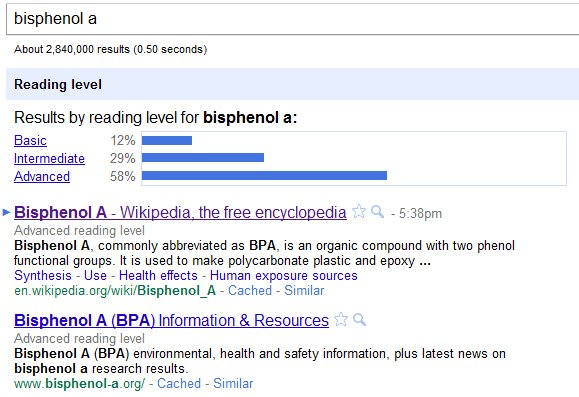 Google's advanced search page has a new feature that lets you restrict results to a certain reading level. You can choose from showing basic results, intermediate results, advanced results or annotating the results with reading levels. "Sometimes you may want to limit your search results to a specific reading level. For instance, a junior high school teacher looking for content for her students or a second-language learner might want web pages written at a basic reading level. A scientist searching for the latest findings from the experts may want to limit results to those at advanced reading levels," suggests Google. Right now, this feature is only available for English web pages, but Google doesn't mention if it uses the Flesch–Kincaid readability tests. According to Google, less than half of the indexed pages are written at a basic reading level, half of the pages are written at an intermediate reading level and about 2% of the pages are written at an advanced reading level. Google published a list of the fastest rising queries this year. The list doesn't include queries that are always popular, since it tries to capture the spirit of 2010. The fastest rising Google query was Chatroulette, the name of "a Russian based website that pairs random strangers from around the world together for webcam-based conversations". It was followed by iPad, Justin Bieber, Nicki Minaj, Friv (a popular online gaming site), Myxer (a site that offers ringtones, wallpapers and apps for mobile devices), Katy Perry, Twitter, Gamezer (multiplayer games) and Facebook. 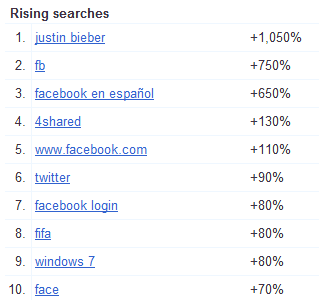 As you can see, the fastest rising queries were related to social networks, mobile devices, games and music. It's interesting to see that there's only one Android phone in the list of top 10 fastest rising queries in consumer electronics: HTC Evo 4G. Apple's iPad and iPhone 4 are the most popular consumer electronics devices, according to Google's search data. iPad is also the fastest rising query in the US. If you go to Google Insights for Search, you'll find different results. Most of the queries from the top 10 fastest rising searches are related to Facebook. There's also a list of the most influential YouTube videos of the year.